NASA’s recent discovery of a new planet circling around a far-off Sun-like star has raised hopes of finding extra-terrestrial life outside our own solar system. The space agency announced that they have discovered an eighth planet circling Kepler-90, a star similar to our sun, 2,545 light years away from Earth. This discovery means our solar system is now tied for the most number of planets around a single star, according to a statement by NASA on Dec. 14. The new planet was discovered using data from NASA’s Kepler Space Telescope and machine learning from Google, and has been dubbed Kepler-90i—a sizzling hot, rocky planet that orbits its star once every 14.4 days. “Machine learning is an approach to artificial intelligence in which computers ‘learn.’ In this case, computers learned to identify planets by finding in Kepler data instances where the telescope recorded signals from planets beyond our solar system, known as exoplanets,” the statement read. Kepler-90 is a Sun-like star, but all of its eight planets are scrunched into the equivalent distance of Earth to the Sun. The inner planets have extremely tight orbits with a “year” on Kepler-90i lasting only 14.4 days. In comparison, Mercury’s orbit is 88 days. Consequently, Kepler-90i has an average surface temperature of 800 degrees Fahrenheit, and is not a likely place for life as we know it. The structure of the Kepler-90’s system hints that the eight planets around Kepler-90 may have formed more spread out, like the planets in our own solar system, and then somehow migrated to the orbits we see them in today. A small area around the Kepler-90 system, on the left, has been searched by the Kepler space telescope. 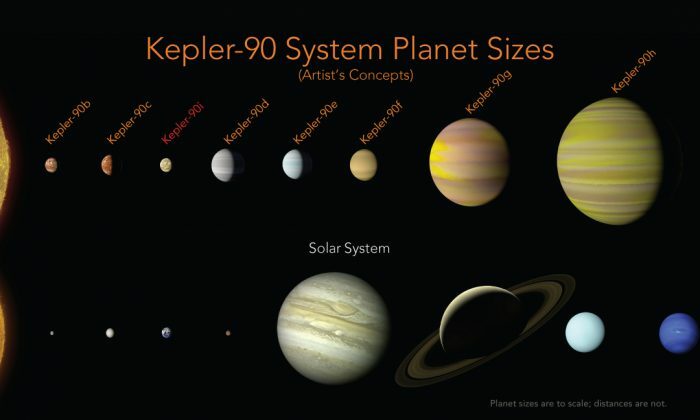 Compared to our solar system, where we know of planets farther out, it is possible that Kepler-90 has even more planets. If planets (in the blue area) do exist, they probably would not have transited enough times while Kepler was watching for us to know they were there. Paul Hertz, director of NASA’s Astrophysics Division in Washington, said the data will be a “treasure trove” for future innovative researchers. “Just as we expected, there are exciting discoveries lurking in our archived Kepler data, waiting for the right tool or technology to unearth them,” said Hertz. In order to identify exoplanets—planets outside our solar system orbiting a star—researchers Christopher Shallue and Andrew Vanderburg trained a computer to analyze light readings recorded by Kepler. The computer would detect the minuscule change in brightness captured by the telescope when an exoplanet passed in front, or “transited” a star. The technique was inspired by the way neurons connect in the human brain and helped researchers sift through the telescope’s data to find the eighth exoplanet. NASA said that other planetary systems probably hold more promise for life than Keplar-90, however, its outermost planet, Kepler-90h, orbits at a similar distance to its star as Earth does to the Sun. The newly discovered planet is about 30 percent larger than Earth and its position in its solar system is on par with Mercury. The average surface temperature of Kepler-90i is believed to exceed 800 degrees Fahrenheit. The different elements in NASA’s exoplanet program, including ground-based observatories, like the W. M. Keck Observatory, and space-based observatories, like Hubble, Spitzer, Kepler, Transiting Exoplanet Survey Satellite, James Webb Space Telescope, Wide Field Infrared Survey Telescope and future missions. “The Kepler-90 star system is like a mini version of our solar system. You have small planets inside and big planets outside, but everything is scrunched in much closer,” said Vanderburg, a NASA Sagan Postdoctoral Fellow and astronomer at the University of Texas at Austin, in the statement. Telescope Kepler has produced an unprecedented data set for exoplanet hunting, according to NASA. “These results demonstrate the enduring value of Kepler’s mission,” said Jessie Dotson, Kepler’s project scientist at NASA’s Ames Research Center in California’s Silicon Valley. “New ways of looking at the data – such as this early-stage research to apply machine learning algorithms – promises to continue to yield significant advances in our understanding of planetary systems around other stars. I’m sure there are more firsts in the data waiting for people to find them,” Dotson added. Along with the statement, NASA conducted a teleconference and a Reddit Ask Me Anything on Dec. 14 to talk about the discovery.